I’ve been having a bit of trouble with printing recently. The filament seems to have trouble feeding through the extruder, sometimes skipping a layer until I noticed it, and gave it a bit of a push through. 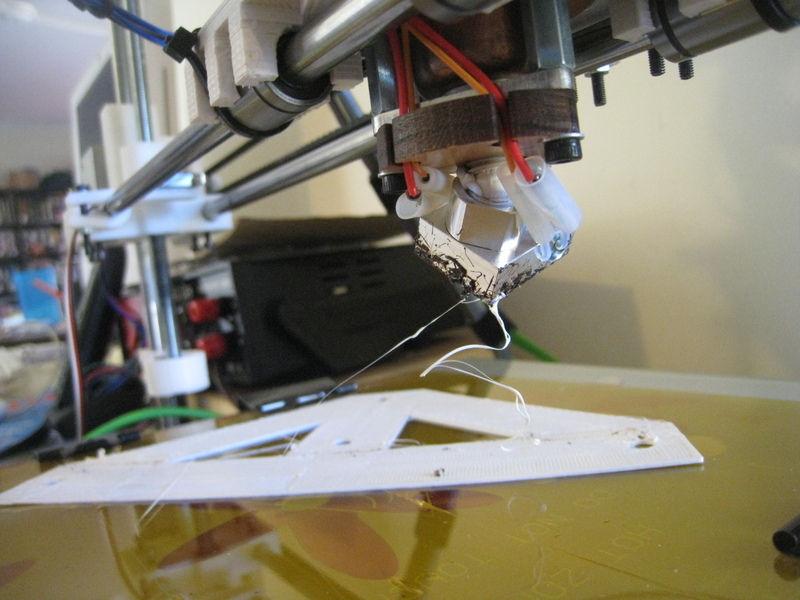 The hobbed bolt seems to be chewing up the filament a bit, though that’s to be expected if it gets stuck. I killed the power, then pulled out the remaining filament before it could cool down, to try and minimise the amount of plastic stuck in the end. Having a look, the PEEK block was obviously gone. The only question was how many other parts were trashed with it. When my Arcol hot-end melted down, it took about six parts out with it at the same time. Once the hot-end cooled down, I disassembled it, to try and see how many parts were trashed. 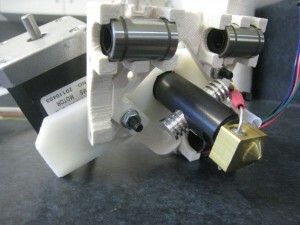 Fortunately, it turned out to be only two parts: The PEEK block and the nozzle. 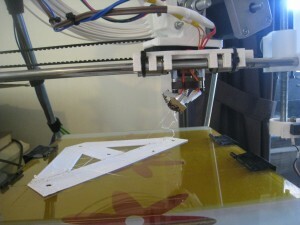 I had a quick look at lulzbot.com, and fortunately, they have spare parts for the Budasnozzle. I was able to order the parts, and a few extra bits for my new printer. I also bought a new hot-end from one of the Aussie Forum members. 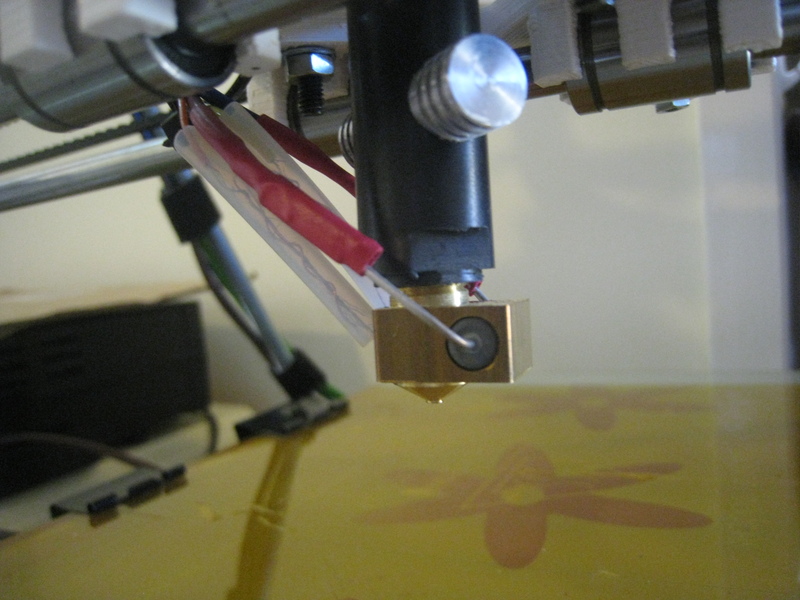 While I was waiting for the new hot-end, and the parts for my old hot-end to arrive, I thought I’d get the printer running again using a spare hot end which I’d previously bought from hot-ends.com after my first meltdown., so I set about trying to fit the new hot-end to the printer. 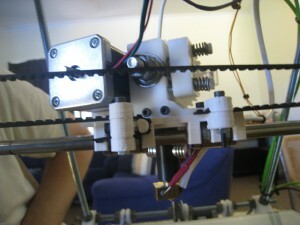 Naturally enough, the mount that the new hot-end had (ring mount) wasn’t compatible with my current extruder. 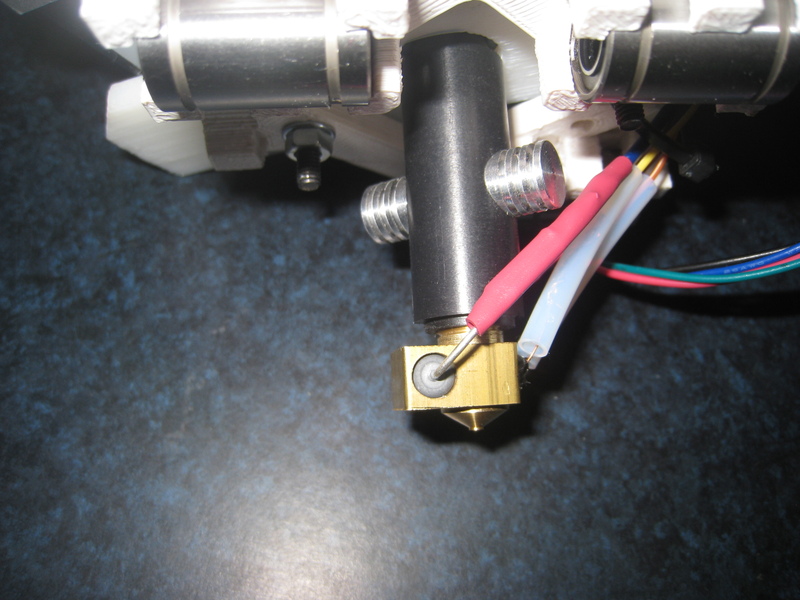 My extruder was set up for the Arcol hot-end, and was compatible with the Budasnozzle, due to its mounting frame which ties in with the extruder mounting points. Similarly, the new hot-end I’d order wasn’t going to be compatible either, as it uses a third type of mount. Making a mental note to print up a new Wade’s Extruder with mounts for ALL my extruders, I had a rummage through my parts box. 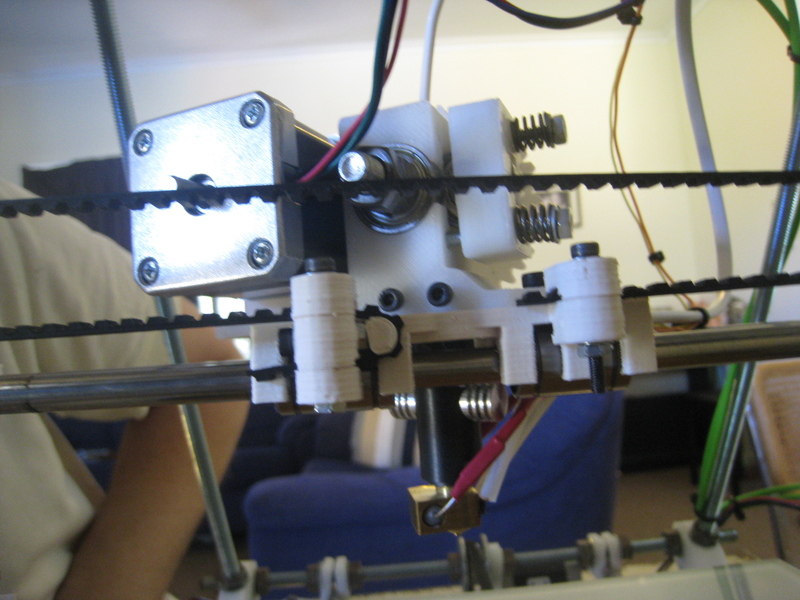 Fortunately, the original (Greg’s) extruder that I had was compatible with the ring-mount. I also took the opportunity to add in a quick-release connector block for the hot-end. 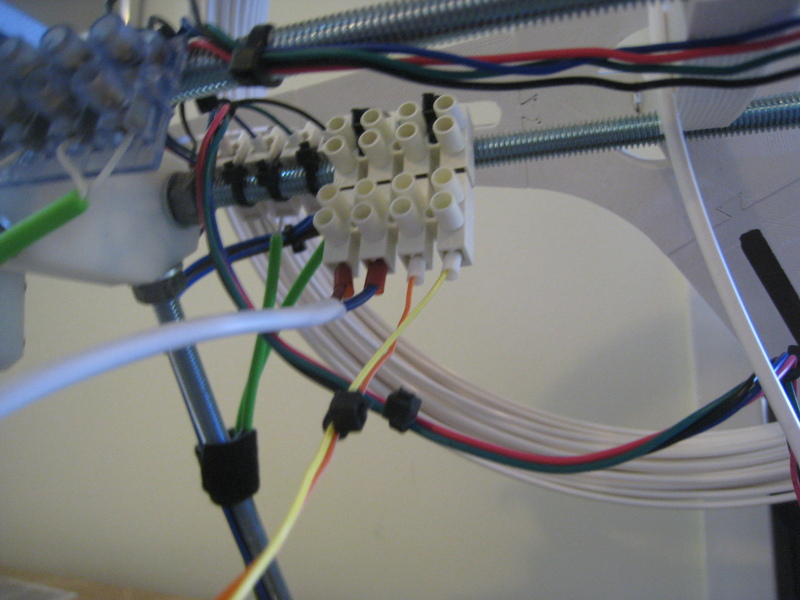 This will make it easier to do extruder change-overs. Once the new hot-end was set up in the extruder, I tried to do some printing. Simple tests worked well, but when I tried to do a print, the filament wouldn’t completely feed through. 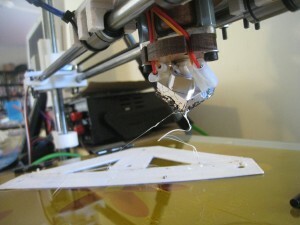 The extruder would take a large bite out of the filament, and not feed it through. The hot-end is working beautifully, so it seems like the likely culprit at this point in time is the hobbed bolt. It must have worn a bit, and the teeth no longer grip the filament enough. I suspect that it’s also to do with the retraction acceleration. 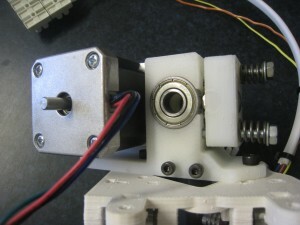 It seems like the hobbed bolt ‘loses its grip’ during the retraction phases, which explains why the printer passed the easy printing tests with no problems – there was no retraction. Perhaps, by slowing down the retraction speed and acceleration, it will make it easier for the bolt to maintain its grip on the filament. 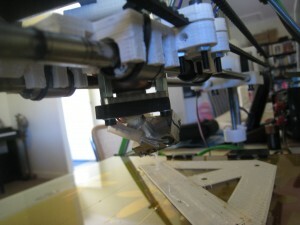 This entry was posted in reprap and tagged hot end, meltdown on May 6, 2012 by David. This blog is basically a lab notebook for various stuff I’ve worked on, or solutions I’ve found. I can then come back and find it again later on, and hopefully someone else might find it useful!